Slack adjusters are used to adjust the braking-induced wear of brake drums and ensure a constant clearance between these components. Slack adjusters are employed in S-camshaft drum brakes and take over the transfer of force from the wheel brake cylinder to the S-camshaft Thus, a manual or automatic adjustment of the S-camshaft is possible, so that the brake cylinder operates in virtually the same stroke range. A distinction is made between manual and automatic slack adjusters. Self-adjusting automatic slack adjusters are quick and easy to install and are optimally constructed. No special adjustment is now required for the correct installation of the brake lever. This provides a larger area of application and a reduction in part numbers can be achieved. A constant readjustment of the slack adjuster prevents the piston stroke of the brake cylinder from becoming too large, resulting in increased air consumption. Consistent brake response time is thereby guaranteed. DT® Spare Parts slack adjusters are particularly robust and lowmaintenance due to specially hardened areas and a cover protecting the mechanism against moisture, dirt and external influences. Furthermore, an increase in the service life is achieved by means of a special sealing construction and life lubrication. 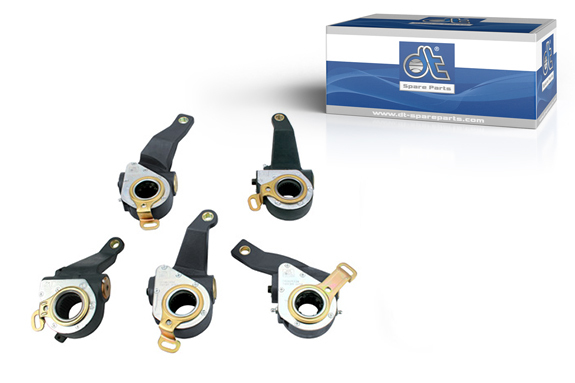 DT® Spare Parts brand slack adjusters are made from the highest quality materials and guarantee a high wear resistance of the individual parts, as well as operational safety.